You might be asking the question, "why should I rent a timeshare instead of a hotel?" 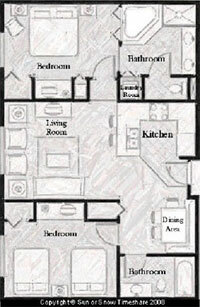 Timeshare units are bigger, with living rooms, kitchens and closed-off bedrooms. It's nice to be able to come "home" to a nice condo after a busy day of "vacationing" and relax in the living room with your family, maybe watch a movie and pop some popcorn. It's also a huge plus to be able to make breakfast in your own unit each day, and maybe a couple of dinners. It can be terribly expensive to eat out three times a day. When we travel, we also keep lunch foods in our refrigerator (sandwich stuff, chips, soda) to pack lunches. The difference in size between a hotel room and a timeshare unit is amazing, and timeshare units are SO much nicer! The master bedrooms in a timeshare unit can't even be compared to a hotel room; the second bedroom is what's comparable to the hotel room. 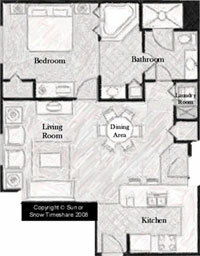 Take a look at the sample floor plans. Not only is there a huge difference in size, but you'd be surprised to know that our timeshare rentals often cost less than a hotel room! We also have more options for our clients during those "hard-to-rent" times, like Spring Break, summer, or holidays. Listed below is a comparison of our timeshare units and hotels/resorts found on hotels.com. We have listed the dates and hotels so you can do your own search. Please note that our prices are the TOTAL cost with no cleaning fees or taxes! When booking through someplace like hotels.com, you are paying an average of 13% tax in addition to the advertised price.